You made it to our Web site, so no doubt, you must be a travel buff (or will soon turn into one we hope!). But, we bet you had no idea about how incredible Maharashtra is as a travel spot, even though it happens to be the fourth most visited state by domestic tourists in our nation. Forget all about the hype about chowpatty, Bollywood celebrities and vada-paav – we’ve got some fun facts about Maharashtra that are going to knock your socks off and have you packing your bags right this instant. Read away and hit the road! According to Maharashtra Tourism, Maharashtra has the most number of forts in India compared to any other state – yep, over 350 to be precise, with 20 of them being sea forts. Bet you didn’t know that! Maharashtra is one of the top border states, with easy access to a wide variety of states with diverse geography, including Goa, Gujrat, Madhya Pradesh, Andhra Pradesh, Karnataka and Chhattisgarh. There are 35 World Heritage Sites recognized by UNESCO in India, out of which Maharashtra has the most (four!) 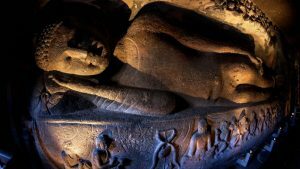 – these include Ajanta Caves, Ellora Caves, Elephanta Caves, and Chhatrapati Shivaji Terminus. The Western Ghats (also known as the Sahyadri mountains) are also noted as World Heritage Sites, as well as one of the world’s ten hottest biodiversity hotspots – four of the thirty-nine properties that comprise the Western Ghats are actually in Maharashtra. Maharashtra is home to two very rare sights – Lonar Lake and Shani Shingnapur. 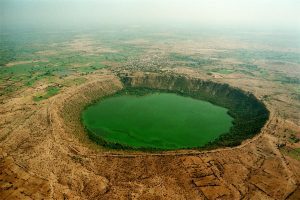 Lonar Lake is a saltwater lake said to have been created by a meteor hitting the Earth – how cool is that! Shani Shingnapur is a unique village in which none of the homes or shops have doors, due to a rumor that anyone who has a door or locks it will be cursed; turns out there hasn’t been any theft reported. Incredible! 5. Variety Is the Spice of Travel! Maharashtra is among one of the top spots when it comes to variety of hill stations AND religious spots – Igatpuri, Mahabaleshwar, Panchgani, Matheran, Karjat, Khandala, Lavasa, Lonavala, Amboli, Chikhaldara,Jawhar, Panhala, Toranmal; if you love the hills, you’ll be quite pleased hill hopping here. And, if you’ve got a strong spiritual side, you’re in luck, too – Shirdi, Tuljabhavani Temple, Gajanan Maharaj Temple, Mahakalkshmi Temple, Haji Ali Dargah, Mount Mary Church, Parvati Temples, Osho Ashram, Huzur Sahib Nanded…the list of possible pilgrimage sites goes on and on! Pretty neat, right? Maharashtra sure has a ton to offer everyone, whether it be hill stations to trek through, waterbodies to laze around at, caves to explore and religious sites to soul search at. If you want to tread the geographically rich terrain of Maharashtra, you might just love our Canvassing the Caves and Craters of Maharashtra package!